Have you ever wished you could create a list of every parenthetical source citation in a 500-page book? Have you ever wanted to make a comprehensive list of the codes in an HTML or XPress Tag document? 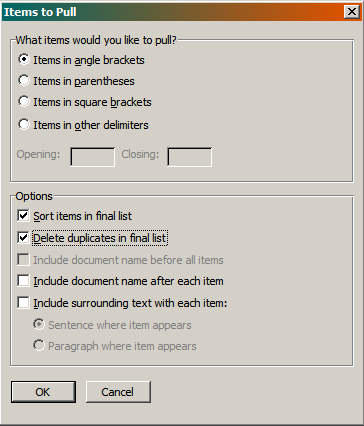 Puller copies delimited items (such as bracketed or parenthetical text) from the active document, all open documents, or all documents in a folder. Then it pastes them into a separate document, sorts the entries, and deletes duplicate items, providing an alphabetical list of the delimited items you specified. If you need to create a summary of any kind of delimited items, you need Puller! You can read the complete documentation by clicking here. Try Puller free for 45 days! Download Puller for Microsoft Word 97, 2000, 2002 (XP), 2003, 2007, 2010, 2013, or 2016. Download Puller for Microsoft Word 98, 2001, X, or 2004. Sorry, but Word 2008 doesn't support macros or add-in programs. If you have a Macintosh and really need the most recent version of Word, you might consider running Windows and Word 2007 under Parallels Desktop. After downloading the program file, open it and drag the individual files it contains out to your computer desktop. Then open and read the Instructions file. Is your evaluation period over? Register Puller and make it run forever! Copyright © 2016 by The Editorium, LLC. All rights reserved. Contact us by .